We reseal stamped concrete patio, using a commercial grade concrete sealer using special additives for slip resistance, and stamped concrete needs a high solids penetrating sealer to make the color pop, while adding a natural shine. Stamped concrete is a custom made product, using concrete with a great new look makings it much more attractive for numerous uses today. 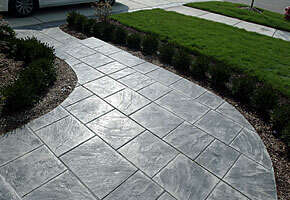 Stamped concrete can replicate lots of other products such as tiles, cobblestones, wood, and stone. It can be impressed with a variety of textures and is then normally colored to additional contribute to the similarity of the material it imitates. ​There are circumstances where plainly the most superior material is concrete in regards to strength and sturdiness however is not preferred due to its look. A walkway made of concrete can be smooth, exempt to buckling or separation as cobblestones might be, however far less attractive than a stone walkway. Stamped concrete enables the house owner to have the beautiful walkway they prefer however also have the strength of concrete to make it last. ​Concrete that has actually been stamped has been around a long period of time. It is only just recently that advances in coloration and texture inscribing have actually made it truly a practical selection for the critical owner and builder. In the past it was a less than acceptable solution used by those who simply needed to have concrete as opposed to other materials and it was quite obviously aesthetically subpar. ​Today concrete that has actually been textured and colored is still concrete with all its strengths however it likewise is a lot more kindlying to the eye. This product is beginning to be typical not only in companies however in high end homes. While a stamped concrete walkway may look much like another product such as natural stone or cobble stones it has few of the same weak points of this material making regular repair works required. ​The stamping procedure for concrete isn't a simple do it yourself task. It needs specialized devices and skill and is a multistage affair. While pouring concrete is reasonably straight forward and almost any individual can do it, the stamping and structure impression procedure is almost always strictly a job for the competent specialist. ​With this procedure, concrete is poured as usual however in a very thick layer more than 4 inches. Colors are commonly added to concrete in the mixer, if not then they are used after the concrete is poured. A release representative is put on the surface of poured concrete, this will enable the texture mats to positioned on the concrete pleased and then release without removing the concrete. ​As soon as the concrete dries for about 24 hours the release representative have to be cleaned off the surface. After the concrete dries a clear sealant is put on maintain the color and texture of the stamping. This might appear like a very complex procedure and it is, but when sturdiness is a have to but visual appeals are also wanted there is no alternative or competition for this type of concrete. ​While colored and textured concrete can not contend in terms of appearances with the real thing such as flagstones or cobblestones it has obvious advantages. This old product has a fresh and amazing new look thanks to some great advances in recent years. Sometimes improvements in old items are as interesting as brand new materials. ​Stamped concrete is an old product, concrete with a terrific brand-new appearance which makes it far more appealing for many uses today. Stamped concrete permits the property owner to have the stunning sidewalk they prefer however also have the strength of concrete to make it last. ​Today concrete that has been textured and colored is still concrete with all its strengths but it likewise is much more kindling to the eye. Colors are often included to concrete in the mixer, if not then they are applied after the concrete is poured. A release representative is applied to the surface of poured concrete, this will certainly allow the texture mats to placed on the concrete amazed and then release without removing the concrete.